The annual Spring Festival migration is simply staggering as more than 400 million Chinese people are expected to leave the major cities to visit their families in rural parts of the country during the Lunar New Year. According to China’s state-run media, 2.46 billion trips will be made by road, 413 million by train, 73 million by air, and 43 million by boat during this year of the pig. Some estimates say half the country is on the move. Although conditions for transportation have improved a lot in recent years, the experience is always a difficult one for most people making the trip, with airports, roads and trains overcrowded and uncomfortable. The Spring Festival is not only a time for family reunions, it is also a golden period for both domestic and international travels. China’s 1.7 billion population will make 3 billion trips around Chinese New Year on February 5 alone, according to government figures. According to Ctrip, Thailand, Japan and Indonesia will be the most popular overseas destinations for China’s tourists this New Year. The U.S. ranks number seven on that list, the same place it held in 2017. But at this festive time, millions of overseas Chinese cannot go home or dare not go home because they have been blacklisted by the communist government or they fear blockage or detention only because they have criticized the communist party or government who has committed lots of crimes against its people. Many individuals forced to leave their homeland have different sad stories to tell. For them, the way to home is too far and difficult. The Spring Festival was originally a ceremonial day to pray to gods and spirits for good harvest. The lunar calendar is still really important in China, even though it has officially changed to the Gregorian calendar like the rest of the world. The festival has a long history. According to legend, there was a monster named Nian. It would come about every New Year’s Eve. When most people would hide in their homes, one boy was brave enough to fight the monster off using firecrackers. The next day, people celebrated their survival by setting off even more firecrackers. And that practice became a crucial part of the festival. There is a day about a week before the Spring Festival dedicated to cleaning. This day is to sweep the bad luck away and make room for the good. Parents would tell the kids that sweeping and throwing out garbage isn’t allowed before the 5th. This is to make sure you don’t wash away the good luck! Chinese families will decorate everything red for the lunar New Year. There are the red lanterns, the red couplets, the red clothing, and the little red envelope with lucky money to kids. All across the world there are lion dances among the Chinese communities to celebrate the Spring Festival. These traditions have developed for thousand of years but the idea has never changed. As millions make the their way home in the country to celebrate the Lunar New Year, news about big companies’ layoffs, the slowing economy and the rising cost of goods has added more uncertainty at a time that is typically marked by festivity. Last year, China’s economy grew at its slowest rate in 28 years and some employers are warning of “tough times” and talking about “surviving” at year-end banquets. On top of that, the U.S.-China trade dispute and tariffs has added to the downward pressure on the economy. For the local governments, this year is shaping up as the most difficult in a long time for China to ensure employment stability. But the Chinese people have the fine qualities to deal with difficult situations. No matter how hard life is, family members would encourage and help with each other out of hardships. Chinese people seldom blame the government as most believe in fate. As the New Year is a time for positivity, people would avoid getting into arguments with people, or even their foes. This year is the year of the pig. Legend has it that the pig is the last animal in the cycle of the 12 zodiac signs. Many people like the year of the pig because the pig represents prosperity and good fortune. Although last year Peppa Pig – the happy cartoon character was banned by the ruling Communist Party for a negative influence on President Xi Jinping, people give it more blessing in shopping malls, grocery stores and restaurants across the country with the image “Peppa Pig Celebrates Chinese New Year”. When we spend time with our families at the festival, we shall not forget those many Muslim families in “Xinjiang re-education camps” or those families of activists wrongly detained in prisons. We hope that with the downfall of the CCP soon in the land of the Middle Kingdom, Chinese people will no longer live as pigs under cruelty of communist dictatorship. With this, the whole Chinese population would remember their gratitude to Miles Kwok and look forward to his whistle blows on the eve of the Chinese Spring Festival. 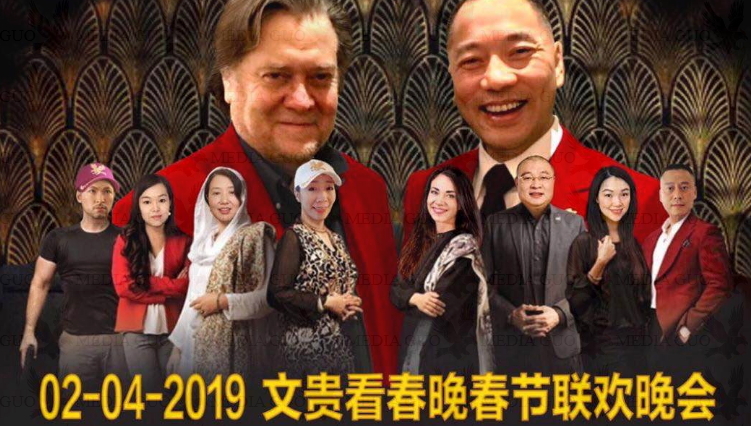 And we hope for the good of all Chinese in the coming year of 2019-2020!